The exhibition held at the Royal College of Physicians is small and limited but to its credit does offer a great insight into the attitude of the country’s leading medical profession to the English Civil War. At the outbreak of war members of the RCP were like many in the country heavily split in their allegiance. It is true that “In the 17th century the College of Physicians was led by a small group of powerful men who held widely differing religious and political opinions”. 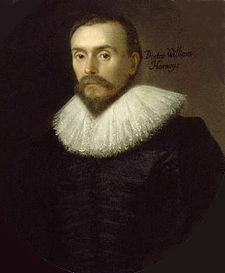 Certainly one of the most famous members of the college was the Royalist physician William Harvey who was described as "a man of lowest stature, round faced; his eyes small, round, very black and full of spirit; his hair as black as a raven and curling"
Harvey was not only responsible for looking after the King's medical requirements but made a significant contribution to the development of medicine by showing how blood circulated around the body. He said of his discovery “I found the task so truly arduous... that I was almost tempted to think... that the movement of the heart was only to be comprehended by God. For I could neither rightly perceive at first when the systole and when the diastole took place because of the rapidity of the movement..."
While Harvey took no time in declaring his allegiance to the crown, it could be said that other RCP members took a longer term attitude to navigate “their way through the conflict, pragmatically switching sides” some it would seem at the drop of a scalpel. The exhibition notes describe the picture left as an “allegorical frontispiece is unambiguous in overall tone. Devil-like figures have commandeered a carriage, taking the crown and 'three nations' hostage, leaving liberty in the balance. Sheep and doves are attacked behind it, and the beheaded King Charles is crushed beneath its wheels. An accompanying explanatory verse was still deemed necessary, making reference to 'wounded justice' and a 'murder'd monarch'. Perhaps one of the major weaknesses of the exhibition is its failure to go into any detail as regards the significant dissension towards the monarchy after all it puts this quote as a subheading of the exhibition ‘...when dissolution and idleness had put an end to good manners), some seditious ‘tribunes’ of the people and ill-conditioned scoundrels ... had defiled all things ... the Phoenix ... rose at last ...’ but fails to explain its meaning. According to William Birken there was quite a tradition of dissension amongst men of medicine. According to Birken “In England, medicine has always been something of a refuge for individuals whose lives have been dislocated by religious and political strife. This was particularly true in the seventeenth century when changes in Church and State were occurring at a blinding speed. In his book The experience of defeat, Christopher Hill has described the erratic careers of some radical clergy and intellectuals who studied and practised medicine in times of dislocation. A list pulled together from Hill's book would include: John Pordage, Samuel Pordage, Henry Stubbe, John Webster, John Rogers, Abiezer Coppe, William Walwyn and Marchamont Nedham.1 Medicine as a practical option for a lost career, or to supplement and subsidize uncertain jobs, can also be found among Royalists and Anglicans when their lives were similarly disrupted during the Interregnum. He goes on “among these were the brilliant Vaughan twins, Thomas, the Hermetic philosopher, and Henry, the metaphysical poet and clergyman; the poet, Abraham Cowley; and the mercurial Nedham, who was dislocated both as a Republican and as a royalist. The Anglicans Ralph Bathurst and Mathew Robinson were forced to abandon their clerical careers temporarily for medicine, only to return to the Church when times were more propitious”. The exhibition is a rare glimpse into the treasure trove of material held by the RCP which in many cases have rarely been seen in public. So anyone finding themselves in London for a bit of Christmas shopping could do worse than going along to see it. While I cannot say I follow your articles for History Today on a regular basis but when an article catches my eye I tend to read it. One such article was called Trotsky Offered Asylum. As the title of your column suggests you write about events from the near or distance past. If this particular article was nothing more than a straight factual account of Leon Trotsky’s exile from the former Soviet Union I would have had nothing to complain about but it was not. I am sorry to say your article was a little dark and had a strong hint of a very conservative bias to it to say the least. My first complaint is that while you mention the struggle between Trotsky and Stalin for students and people coming to this subject for the first time you would not garner from your article that this was little more than just a personality clash that Trotsky lost. The life and death struggle was deeply political and to no small extent decided the course of the 20th century and not for the better. In fact mankind paid a very heavy price for Trotsky’s “fall” from power and subsequent murder. What I am trying to say that your article does not mention a single political difference between Trotsky and Stalin. I admit you have a lack of space but your article would have been strengthened by at least a cursory examination over the controversy over Stalin’s theory of building socialism in a single country versus Trotsky’s insistence on global revolution. This aside there are other things in the article that I would like to address. One of your turn of phrase left me a little cold and to say the least was a little sinister. To describe Trotsky’s murderer as a “charming Spanish Communist painter “is a little ridiculous. He was a murderer who pursued Trotsky and under Stalin’s personal order caved his skull with an ice pick, perhaps you could explain what was charming about this. While we are on the subject of Trotsky’s murder to describe the act of murder as a “stab” of an ice pick is just plain bizarre. Trotsky’s skull was caved in why you downplay this horrendous assassination. My last point is that while it is difficult for a historian to come out of their comfort zone and write on a subject they know little about I must take exception to your description of Robert Service as “Trotsky’s biographer”, given Service’s very right wing biography which is strewn with major errors it is simply not true. If readers new to the subject of Trotsky's life would like to view a more balance view then they should look no further that Isaac Deutcher’s three volume trilogy. The compliment you pay Service is not deserved. Hill's essay was first published in Three British Revolutions, 1641, 1688, 1776 Ed J A Pocock (Princeton U.P 1980) and contains within it a change in Hill’s 1940s position on the English bourgeois revolution. Some historians both hostile and friendly to Hill have seen this essay as Hill repudiating his previous estimation of the bourgeois revolution. I do not agree with this supposition. In fact, the older Hill got, the more he understood the complex problem associated with an explanation of the transformation of Britain from a feudal society into a capitalist one.Hill begins this essay with a defence of his method and integrity. Throughout his career Hill was accused of being dogmatic, a “Rolodex” historian and only using sources that fitted in with his Marxist assumptions. My own understanding of Hill is that while he was a Marxist, he was none of the above. He was an excellent historian, and like all historians, he was always revising his understanding of the English revolution. This attitude is best summed up by this quote from Hill, “The historian should not stay on the surface of events; his or her interest should not be limited to State Papers, Acts and Ordinances, decisions of judges and local magistrates... He or she should listen--carefully and critically--to ballads, plays, pamphlets, newspapers, tracts...to every source that can help him or her to get the feel of how people lived and in what ways their sensitivity differed from ours... The historian must listen to alchemists and astrologers no less than to bishops, to demands of London crowds; and he or she must try to understand the motivation of rioters, whether they are labelled anti-Catholic or anti-enclosure rioters or simply food rioters”. The English Bible and the Seventeenth-Century Revolution (London, 1993), pp436-437. The central theme of this essay as the title suggests, was there was there a bourgeois revolution? Hill in this article observed that it was tough to offer a precise definition of bourgeois revolution. 'The Marxist conception of a bourgeois revolution, which I find the most helpful model for understanding the English Revolution,' he wrote, 'does not mean a revolution made by the bourgeoisie'. There was no self-conscious bourgeoisie which planned and willed the revolution. But the English Revolution was a bourgeois revolution because of its outcome, though glimpsed by few of its participants, 'was the establishment of conditions far more favourable to the development of capitalism than those which prevailed before 1640'. 'A Bourgeois Revolution?’ op cit, pp110, 111, 115, 134. The 1980 essay is a confirmation that in later life Hill never repudiated his previous position he attempted to reformulate specific thoughts. In 1967 he wrote Reformation to Industrial Revolution (1967), while still retaining the idea that it was a bourgeois revolution he sought to give the term a more precise approximation. He intimated that the revolution was not as clear-cut as he had thought and neither was a chemically pure as had been written on. After the entire bourgeoisie in its various forms did fight on both sides. But he is clear on the fact that the revolution made a path for further and rapid capitalist expansion. With a few reservations, I think Hill is correct when he says that the 1640 “bourgeois revolution” was not “consciously willed by the bourgeoisie”. This is not to say that the revolution did not have its thinkers or that philosophy played no part in the revolution. At the heart of Hill’s position is that he believed that the actions of the leading figures of the revolution were to some considerable extent empirical. Having said that” he was sensitive enough to his historical sources to detect the social currents that brought people of diverse social backgrounds into struggle against the king and well-grounded enough in history to identify new and revolutionary ideas in the curious and archaic guise in which they appeared—as the ideologists of the revolution ransacked the Bible and half-understood historical precedent for some kind of theory to explain what they were doing”. "These the times ... this the man": an appraisal of historian Christopher Hill by Ann Talbot 25 March 2003. Hill’s work was apparently groundbreaking he defined the mid-seventeenth century crisis as a revolution. His definition of the revolution that the rule of one class was replaced by the rule of another still stands the test of time despite a ferocious attack by the revisionists. As Ann Talbot said “Most of all, he was sufficiently astute to realise that when the people execute their king after a solemn trial and much deliberation, it is not the result of a misunderstanding but has a profound revolutionary significance entailing a complete break with the feudal past. Although the monarchy was later restored and the triumphant bourgeoisie was soon eager to pretend that the whole thing had been a ghastly mistake, no monarch sat quickly on the throne after that event until quite late in Victoria’s reign”. While Hill maintained that the bourgeoisie was barely conscious of its actions his writing imbues a recognition that revolutions are not solely made by a tiny elite. In the case of the 1640 revolution, the mass of the population was involved and that a change in the consciousness of that mass of people did change. This change was in distorted form reflected in the writings of the Levellers. Hill paid considerable attention to the radicals of the English revolution of groups such as the Levellers and Diggers, and he was correct when he said that while these were the most conscious revolutionaries, they were second in importance to Oliver Cromwell as a revolutionary force. Again in this essay Hill would have appeared to have revised his previous position on the Levellers.